What Do You Want To Know About The 2018 Mercedes-Benz E400 Wagon? Here in America, we find ourselves with a sudden wealth of wagons as a nice byproduct of the crossover boom. Well, maybe not a wealth, but there’s more available now than in many years past. Kristen is driving the Buick Regal TourX and just tested a Volvo V90 Cross Country; BMW, Volkswagen, Mini, Audi and Jaguar (!!!) all have wagon options too; and we’re even set to drive the Porsche Panamera Sport Turismo in March. But there’s one wagon stalwart that’s pretty much always been here, and it’s the Mercedes-Benz E-Class wagon. I’m driving one right now. What do you want to know about it? 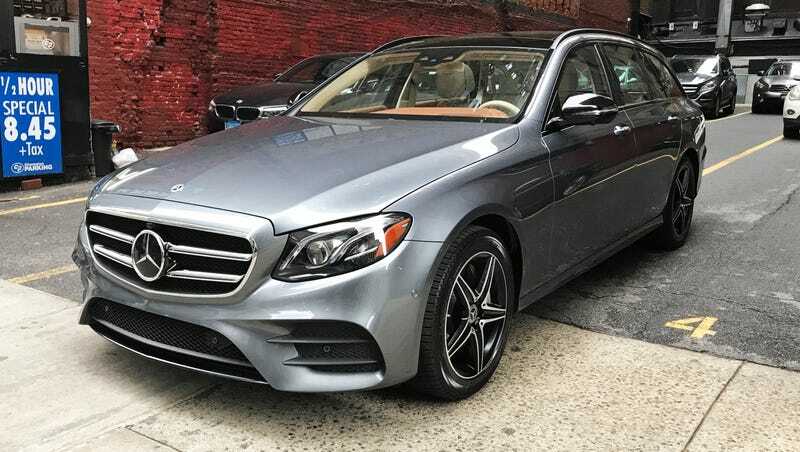 Somewhat sadly, this is not the bananas 603 horsepower Mercedes-AMG E63 S Wagon, although it’s nice enough and good enough that I’m never disappointed to be in it. It is the E400 4Matic wagon, the only non-AMG option for that car you can buy in America and the only wagon in Mercedes’ U.S. lineup. It’s no slouch, with a 3.0-liter biturbo V6 good for 329 horsepower and all-wheel drive. These things start at $63,050—a $10,000 premium over the E-Class sedan—but with press-car-tastic options my tester comes in at just under $90,000. It’s a nice car, and an expensive one! I’m trying to determine if it’s worth it or not. If you have questions, speak now or forever hold your peace.